You are here: Home / Uncategorized / My Favorite Post of 2013…..
My Favorite Post of 2013….. I love the new year! Something about starting fresh every year with a clean slate and an optimistic outlook is forever appealing to me. And of course a huge part of starting fresh is reflection. What is the point of making goals without the opportunity to reflect on previous plans and if you were able to accomplish them? My biggest goal last year was creating this little place on the internet called Babble Dabble Do. I wanted to make an online “studio” parents could visit when they wanted to find unique, educational, creative, and relatively easy projects to do with their children. I still have a long way to go, but all in all I accomplished my goal, now I aim to keep a more steady pace up in 2014 for all my wonderful readers out there! Babble Dabble Do wouldn’t be here without your readership so THANK YOU for being a part of my blog and for coming back to check out our latest ideas! Marbled Milk Painting was one of the most challenging and exciting projects I developed last year. It took me oodles of time to figure out the right method to produce beautiful and reproducible results and in the end I was truly pleased at how this project combined science, art, and design, all in one nifty little project. It reinforced my belief that kids learn best by doing hands on creative projects that cross disciplines. If you haven’t checked it out yet click here for the full tutorial. Here’s a sneak peek to wet your appetite…. I’m also excited to be sharing this post with you as part of an amazing blog hop from the Kid Blogger Network starting today! Here’s to a creative 2014! Happy New Year from the KBN Best of 2013 Blog Hop Co-Hosts! Powerful Mothering, The Good Long Road, All Done Monkey, Afterschool for Smarty Pants, B-Inspired Mama, Babble Dabble Do, Bits of Positivity, Boy Mama Teacher Mama, Caution! Twins at Play, Child Central Station, Creative Family Fun, Creative World of Varya, Cute and Peculiar, Dirt and Boogers, Edventures with Kids, The European Mama, The Eyes of a Boy, The Fairy and the Frog, Frogs and Snails and Puppy Dog Tails, Fun-A-Day!, Growing Book by Book, Hands on: as we grow, Here Come The Girls, iGame Mom, I Heart Crafty Things, Inspiration Laboratories, Kid World Citizen, Kiddie Foodies, Kids Yoga Stories, Kitchen Counter Chronicles, Lalymom, Lemon Lime Adventures, Let’s Play Music, Living Montessori Now, Mama Smiles, Multicultural Kids Blog, My Little 3 and Me, P is for Preschooler, Peckle Pie, Pennies of Time, Playdough to Plato, PlayDrMom, Preschool Powol Packets, Racheous – Lovable Learning, Still Playing School, Smiling Like Sunshine, Stir the Wonder, Teach Me Mama, Teach Preschool, There’s Just One Mommy, Toddler Approved, True Aim Education, Tutus and Tea Parties, Where Imagination Grows and Wildflower Ramblings. The marble milk paper is so pretty! Making sure I’ve pinned it! I hope you have a chacne to make it! It’s a lot of fun! Great to be doing the blog hop alongside you. I love your marbled milk paper. So happy to be Blog Hopping with you! So many great ideas! 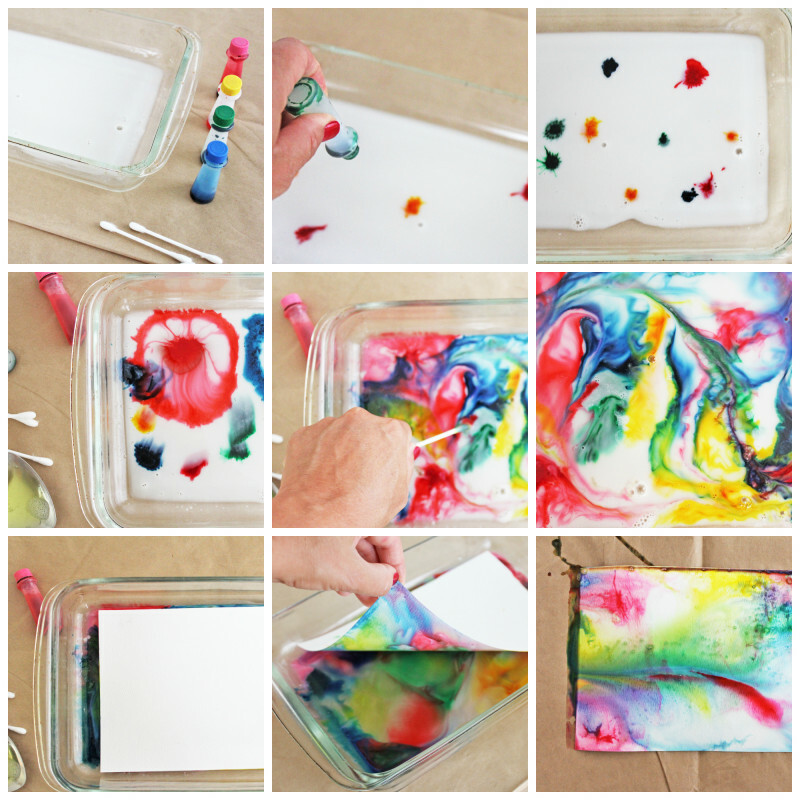 Popping over from KBN – I love this – we have tried the traditional way of doing marbling with inks, oil & water but I never thought of using milk – makes it much easier to see the colour pattern and spread! Thanks Helen! It’s fun to work with unusual art materials!